The HELIX 9 CHIRP MEGA SI+ GPS G3N is one of the new Humminbird fish finders released in 2019. 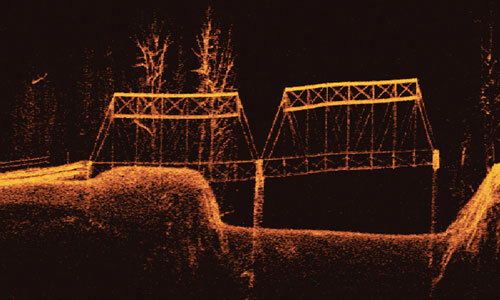 Although it basically offers the same range of features as the last year’s HELIX 9 CHIRP MEGA SI GPS G2N, the new MEGA Imaging+ sonar technology does offer superior quality in terms of imaging and depth capability. The unit also has a richer pixel resolution and comes with the new MSI+ / MDI+ transducer. For reference, this is the Humminbird part number 410860-1. The Humminbird HELIX 9 CHIRP MEGA SI+ GPS G3N basically has the same transducer and sonar features as the HELIX 8 MEGA SI+ which we have already reviewed. 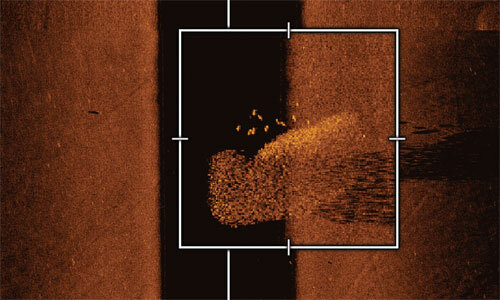 It offers Dual Spectrum CHIRP sonar, MEGA Side Imaging+ and MEGA Down Imaging+. It supports multiple base sonar frequencies, including 50/83/200/455/800 kHz & 1.2 MHz. Also, like all the other G3N units, this one supports Ethernet, and therefore it is compatible with 360 Imaging sonar. The unit includes the XM 9 HW MSI T transducer which supports each type of sonar offered by the unit. This transducer has a metallic transom mount, 20′ (6 m) of cable, and incorporates a temperature probe. For Side Imaging, the transducer uses thin oval beams with a coverage of 86°, and a maximum side-to-side range of 800 (244 m) at 405-505 kHz. The MEGA SI+ (1050-1175 kHz) range is 400 ft (122 m) side-to-side, 200 ft (61 m) on each side, which is quite a bit more than the regular MEGA SI which offers only 250 ft (76 m) full coverage. The depth capability of the Side Imaging and MSI+ is not specified. However, since it’s not as great as Down Imaging, our estimation is 125 ft (38 m). For Down Imaging, the transducer also uses oval-shaped, thin beams. The maximum coverage is 75° at 435-535 kHz, and for MEGA DI+ at 1100-1200 kHz. The 800-860 kHz mode offers a coverage of 45°. Also, the maximum depth capability for the unit’s Down Imaging sonar is 400 ft (122 m) at 455 kHz (435-535 kHz), while for MDI+ the maximum depth capability is around 200 ft (61 m). For Dual Spectrum CHIRP sonar, the unit offers three main modes, Full Mode (150-220 kHz), Wide Mode (140-200 kHz), and Narrow Mode (180-240 kHz). For the Narrow and Wide Modes, the CHIRP interval is fixed, while for the Full Mode, the 150-220 kHz is the default value. The range can be adjusted between 140 kHz and 240 kHz. The transducer uses conical beams for Dual Spectrum CHIRP. Their coverage is 42° for Wide and Full Mode, and 25° for Narrow Mode. Also, the maximum depth that can be reached by the 2D sonar of this fish finder system is 1,200 ft (365 m) when using Wide Mode. The unit offers the full range of standard sonar features. Among them, we can count SwitchFire, Selective Fish ID, Real Time Sonar (RTS), Bottom Lock, Fish Alarm, Depth Alarm, Split-Zoon, Circular Flasher, and more. It also has Sonar Recording, but in order to record and rewind the sonar history, you will have to save the date on a microSD card. This Humminbird fish finder is also a chartplotter. It is equipped with the Humminbird Basemap platform. 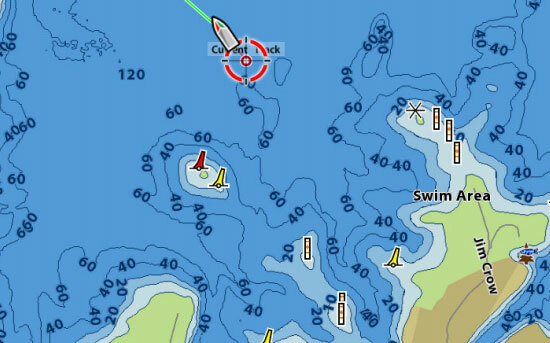 These charts offer detail that is pretty close to the Navionics+ charts. They cover more than 10,000 U.S. lakes, as well as the U.S. East Coast, and West Coast showing a wide array of points of interest such as marinas, hazards, buoys, nav-aids, spot sounding, piers etc. In terms of chart compatibility, the unit is pretty versatile as well. It supports Navionics+, Navionics Platinum, LakeMaster charts, LakeMaster Plus charts, as well as SmartStrike fishing charts. AutoChart Live is also available with this unit. This is a depth contour recording function similar to the SonarChart offered by Navionics. It uses the GPS data and the 2D sonar data in order to reveal and draw the depth contours of the body of water that you’re scanning. Therefore, you can create your own personalized chart for each lake where you fish, in case the data of the built-in charts is not up to date. The unit can save up to 8 hours of AC Live recording in its memory. However, you can always expand the recording capacity by a Zero Lines card. Needless to say, the unit has internal GPS. It can use WAAS, EGNOS, or MSAS for position augmentation. It can show the coordinates for any point of interest or your location. It has a GPS speed function which means that it can calculate the speed of your boat. The unit supports external GPS heading sensors, Radar, and AIS data as well. Plus, it’s i-Pilot Link compatible. The unit can save up to 2,750 waypoints in its memory. It gives you the possibility to personalize each waypoint, choosing from an extensive database of icons. It also has route creation and track recording functions, allowing you to save up to 45 routes, and 50 tracks with up to 20,000 points per track. The Humminbird HELIX 9 CHIRP MEGA SI+ GPS G3N features a 9-inch display, with a 16-bit color range and LED backlight for superior readability. It has a richer pixel matrix than the G2N unit, with 1024 x 600 pixels (up from 800 x 480). The unit does not have cross-touch technology like the SOLIX units; it’s keypad operated. Its interface is very easy to use and highly intuitive. The unit is also IPX7 waterproof, which means that it can resist incidental water exposure and even full immersions in freshwater. Just like the other HELIX units, the 410860-1 includes the standard Gimbal mount, while the in-dash mounting kit is optional (not included). The box also does not include a unit cover. In terms of networking, the unit is Ethernet and NMEA 2000 capable. Therefore, you can connect it to an already existing boat grid, or to various other instruments such as Radar, AIS units, and more. Wireless connectivity is also available. Therefore, you can sync your unit with your smartphone via Bluetooth and benefit from software updates or even notifications from your phone through the FishSmart App. The unit is also compatible with the RC2 Bluetooth remote control. Last but not least, the unit has a dual microSD card reader. Therefore, you can use a chart card and a data card simultaneously which can save a lot of hassle. The trolling mount for the transducer is not included. 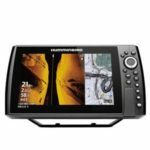 The Humminbird HELIX 9 CHIRP MEGA SI+ GPS G3N offers MEGA SI+, MEGA DI+ and 2D CHIRP sonar, GPS, and the Humminbird Basemap charts. It includes the XM 9 HW MSI T transom transducer. It also supports NMEA 2000, Ethernet, Radar, 360 Imaging, and more. It also has wireless connectivity. It’s an excellent fish finder and chartplotter for both freshwater and saltwater, perfect for a wide array of boats. It’s not exactly one of the most affordable Humminbird units, but definitely offers excellent value for the price.